Although I'm a bit bleary with the changeover to daylight savings time, I am exceedingly buoyed by the coming of spring. 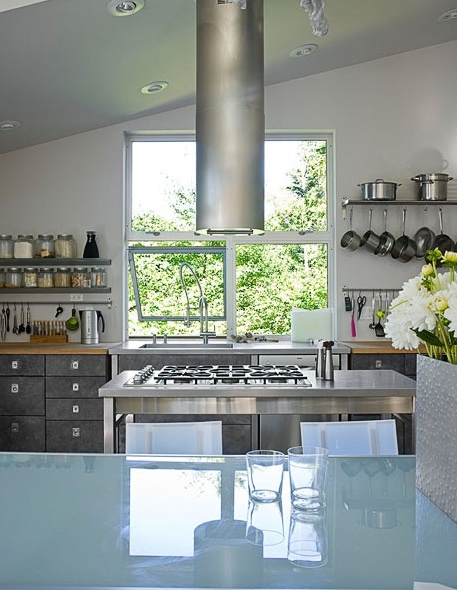 Looking at this bright kitchen, with its view of sunlit treetops reflected on the glass counter, sweeps away much of winter's grey mentality for me. 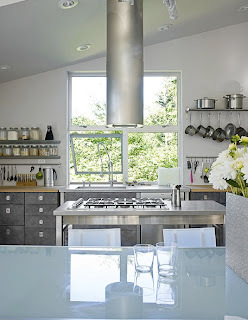 On a more practical note, keeping the work surface of the island to a minimum reinforces its role as a cooking station; while I'm doubtlessly projecting too much into the design, this seems to discourage lingering in the kitchen, and gently diverts guests outdoors.